The continent has the widest variety of natural wonders, animals and plants. The diversity and versatility is so immense, you would need a lifetime to explore it all. It is difficult to conjure a list of only ten sites. But here is this week’s choice – check it out. The location does not look impressive at all – it is dry, arid and plain. However during spring it changes into something surreal. Thousands of colorful flowers start to bloom and spread a fragrant cloud over Namaqualand. Tourist often come to admire the site. Richtersveld – a part of Namaqualand – is a national park and a World Heritage Site. Many visitors come to see the phenomenon during spring. An active volcano is famous for housing the biggest lava lake in the world. The volcano’s slopes are steep and lava is very fluid, thus enabling it to flow in high velocity when it erupts. However, the lava lake is not constantly present. It takes years to form and after that it is a question of days when the walls of the crater will crack and lava erupt. The last eruption took place in 2002. As for today, the volcano’s activity is being carefully monitored, lava is again slowly rising and forming a lake. The remote island in the Indian Ocean, 2,000 km (1,200 mi) away from Africa, is a very attractive tourist destination. The underwater waterfall, located on the southwestern shore, might serve as a signature of Mauritius. It isn’t an actual waterfall, but an optical illusion: the sediment of sand and silt create this dramatic site. The reason for this is that the island is relatively new and a formation of it is still present, causing an underwater slope. Tourists are offered to relax in the white sandy beaches and enjoy the warm water, explore the mountains, a reef and underworld world. Probably the most beautiful canyon in the world stretches for 25 km (16 mi) to the north of the Drakensberg. It certainly is the biggest green canyon on Earth: lush foliage covers the precipitous red sandstone cliffs. Besides the thick forests, the canyon is also home for various species: hippos, antelopes and numerous primates. It also features several waterfalls and viewpoints. One of the most fascinating views we have ever seen is found in Namibia, where Namib Desert meets Atlantic Ocean. However, there is no other way seeing it but from the plane. The vast desert sprawls for thousands of kilometres before it drops into cold and tempestuous waves. However, there are dunes that can be approached on tour and also Kolmanskop – a ghost town, ruined by the desert, today a popular tourist destination. Namib-Naukluft National Park, however, is accessible for the tourists. The distinctive feature of this location is the red dunes, that create a truly beautiful landscape. Bordering two countries – Zambia and Zimbabwe – the gorgeous waterfall is one of the most popular in the world. The waterfall was named after Queen Victoria by a Scottish explorer David Livingstone. However, the locals call it Mosi-oa-Tunya – the smoke that thunders. Moreover it has an unusual Devil’s Pool – a natural pool on the Zambia’s side. The site is very popular among the tourists, therefore many buses and trains drive here, making it an easily accessible spot. The iconic peak is overlooking the vibrant city and attracts hikers as well as climbers. Although it is easily accessible on foot, there is also a cable car, which is so popular among the visitors. Moreover, the innovative cars’ floors rotate, thus giving an extra excitement and views to the city, ocean and the mountain. Visit the mountain and its popular Lion’s Head – a peak that protrudes above the abyss, admire the panoramic and breathtaking views from the top. The dirt road between Morondava and Belon’i Tsiribihina is known for the group of these giant trees growing around this section. The road is one of the most popular and visited places in Madagascar. The dirt road between Morondava and Belon’i Tsiribihina is known for the group of these giant trees growing around this section. The road is one of the most popular and visited places in Madagascar. The avenue is considered to be one of the world’s most exciting roads. It is the most visited park in Africa. The tropical and subtropical savanna covers 14,763 km2 of area. t is famous because of its vast majority of animals. Predators and their prey form the dramatic scenery. Lions, zebras, crocodiles, buffaloes, black rhinoceros, elephants, flamingos, giraffes, leopards and other species are grazing free in the park. The visitors are offered to go on a safari: not particularly to hunt, but to observe and photograph the animals, birds and nature. With a guide the tourists have an opportunity to explore, discover and learn about the African wildlife. At 5885 m (19 308 ft) high Kilimanjaro is the highest mountain in Africa and the highest free-standing mountain in the world. Actually it is a volcano, composed of three distinct cones. It is not a very difficult mountain to climb – you don’t have to be a professional. However, the sickness due to the altitude often prevents from reaching the 5,895 m (19,341 ft) tall peak. On the top of it there are glaciers that are really pretty. 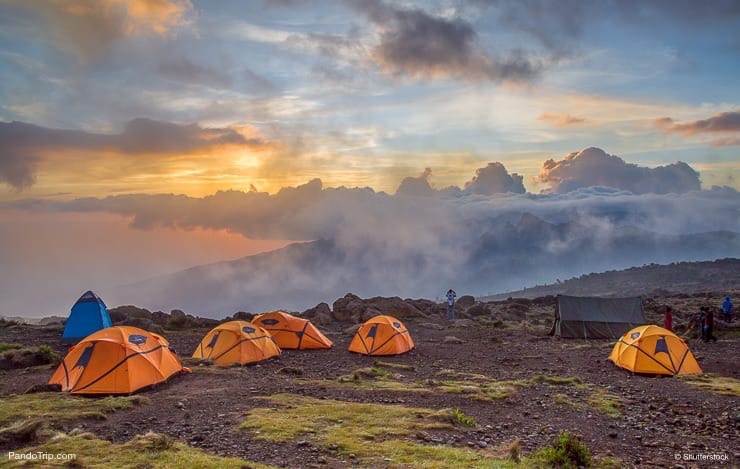 Africa’s highest mountain has a variety of more or less difficult routes to choose from. If you won’t climb, there’s plenty to see in the Kilimanjaro National Park.